Despite slumping housing prices in pretty much every neighborhood of the Twin Cities, the assessed home value on homeowners' property tax statements aren't decreasing at the same rate and, quite commonly, are actually increasing. So what gives? Is this just government greed? Or is there a legitimate reason for the increases? The answer, as usual, lies somewhere between the two. "Assessors are working with a bit of a lag here," said Gordon Folkman. Folkman directs the property tax division for the state's Revenue Department. He said the information that assessors used to determine home values for next year was actually collected in 2006 and 2007, before this year's economic meltdown. Good, old-fashioned, inefficiency is partly to blame. Woefully outdated information from 2006 and 2007 is still being used to find comparable sales for assessment purposes, despite the fact that the housing market has shifted downward dramatically since then. Whether this questionable choice is due to a pre-mediated strategy or something less sinister like a simple lack of up-to-date sales information is unknown, at least to this author. "I'm going to get really pissed in about 10 seconds if someone doesn't explain this to me." Christopher Rocco of St. Paul is big enough to be a bodyguard. He's standing an inch from the county assessor, arguing that the valuation for his townhouse is too high. According to the county, the value of Rocco's home is $120,000. But he says that can't be right. Seven of the 21 units in his complex are in foreclosure. "They're selling for $20,000 apiece. So if they're trying to tell me that they're going to tax me on a $120,000 home when everyone's property values is $20,000, I'm not going to stand for that." This raises another question: do city or county assessors consider bargain-priced foreclosures, which are sometimes in distressed physical condition, to be useful comparative sales? In other words, will the $20,000 sales in Mr. Rocco's building be considered "market value" eventually? There doesn't seem to be a uniform policy on this question amongst the region's patchwork of assessors. With some areas seeing more than half their sales mediated by a lender through a foreclosure or short sale, one would have to think they can't be ignored for much longer. Time will tell. For information on how to contest your tax assessment in the City of Minneapolis go here. 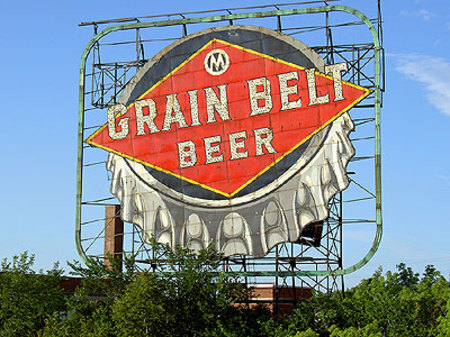 For St. Paul, go here. Like Adam West as Batman, the market for home sales in the Twin Cities went POW! during the week ending August 30. For the week, there were 965 purchase agreements signed—a whopping increase of 51.3 percent from the same week last year. 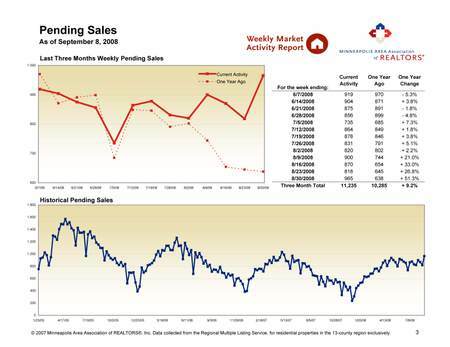 That's the highest year-over-year increase in pending sales since we began tracking that figure on a weekly basis in 2004. Home-buying activity is particularly heavy relative to last year due in all likelihood to a) the historically sluggish showing in August of last year as the credit crunch took hold, b) a bevy of buyers taking advantage of the final days of FHA's seller-funded downpayment assistance program, which sunsets on October 1 of this year and (c) new home buyers getting off the fence and taking advantage of the new home buyer tax credit of up to $7,500. This week's edition of the MAAR Weekly Market Activity Report features updated figures for several key metrics. Days on Market Until Sale dipped slightly to 143 but remains up from last year by 5.8 percent. The Percent of Original List Price Received at Sale increased slightly to 92.7 but remains down from the healthier levels of the past several years. The Housing Affordability Index increased to 151, thanks to falling prices and interest rates. The Months Supply of Inventory fell to 9.9 months. This means it will take the current crop of properties for sale approximately 9.9 months to completely sell through, given current sales rates. This is dead-even with this time last year, another indication that the market isn't continuing to shift in the buyer's favor anymore for the time being. A balanced market is thought to have a 5- to 6-month supply rate. Click here for the full Weekly Market Activity Report, and take a look at the roller coaster ride that is pending sales in the image below. A fair warning: we're all going to hear A LOT in the media and blogosphere in the weeks ahead about the recently passed congressional housing legislation. And it's not because Americans have suddenly turned into staunch economic policy wonks. In part it's because the public is hankering for some sort of action from their elected officials in the face of recession (though how effective that action will be is highly questionable), and also in part because the whole housing mess is so darn complicated -- so many ins, so many outs -- that we're all still trying to wrap our collective heads around how exactly we got to this low point. "Lenders ignored the warning signs because they were part of a system built around the principle of heads I win, tails someone else loses. Mortgage originators didn’t worry about the solvency of borrowers, because they quickly sold off the loans they made, generally to investors who had no idea what they were buying." The City of Minneapolis is tired of sitting back while foreclosures pockmark the visage of parts of their fair city. Fearing neighborhood degredation, they're trying to spur some of the kinds of redevelopment that city councils and neighborhood groups always love. Basically, anything but rental conversions. 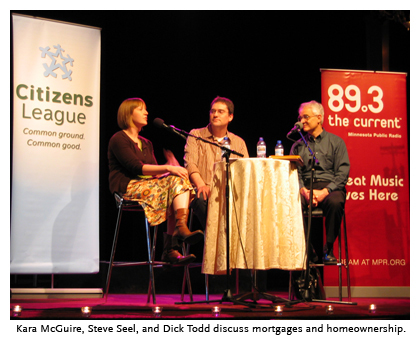 Thus enters the Minneapolis Advantage Loan Program, a downpayment and closing cost assistance program which offers $10,000 zero percent interest rate loans forgivable over five years to anyone buying a home in one of the city-defined eligible neighborhoods. How does the city define an "eligible neighborhood?" It's actually quite objective and reasonable, much to our delight. Areas of the city which have been affected significantly by foreclosures, as expressed by a ratio of foreclosures compared to all properties, are the programs' focus. Click here for an excellent (but unsurprising) map. For more information, check out some FAQ's and a general run-down.